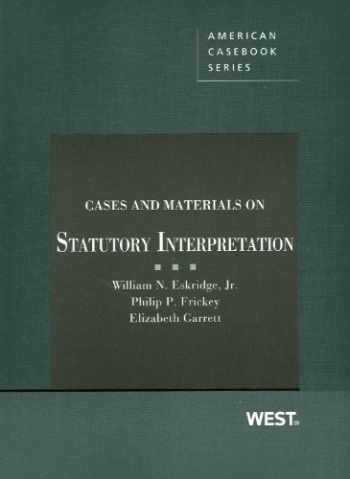 Acknowledged author William Eskridge Jr wrote Cases and Materials on Statutory Interpretation (American Casebook Series) comprising 912 pages back in 2012. Textbook and etextbook are published under ISBN 0314278184 and 9780314278180. Since then Cases and Materials on Statutory Interpretation (American Casebook Series) textbook was available to sell back to BooksRun online for the top buyback price of $57.94 or rent at the marketplace. Drawn from and updating the materials in the authors' landmark casebook on legislation, this new casebook is a comprehensive and highly teachable introduction to statutory interpretation. Reflecting new scholarship, as well as recent federal and state cases, the editors have included and updated many teachable statutory interpretation cases found in the longer legislation casebook. This shorter book is perfect for upper-level legislation courses that focus on statutory interpretation and for first-year regulatory state courses that spend a significant time on statutory interpretation.